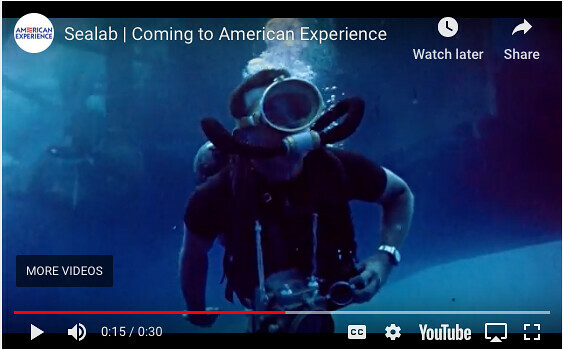 American Experience is doing a complete show on SeaLab, airing February 12, 2019. I'm going to be watching if at all possible. This seems like it may be a series of three presentations, first on SeaLab itself, then on Papa Topside (George Bond), and finally on Scott Carpenter. Here is an interview with Ben Hellwarth, who wrote the book on SeaLab. I got it set to be recorded, looking forward to this. Nice shot of Hope-Paige Mouthpiece at the 15 second mark on the first film. Many of the U.S. Navy divers actually exchanged the U.S. Divers Company mouthpiece out for the Hope-Page mouthpiece. Here's a screen shot of that mouthpiece. Note also the two camera housings. One is for a Nikonos, Probably a Nikonos II. The other is a housing for a professional camera, probably a Hasselblad. Tomorrow's showing should be very interesting. The Nikonos II was produced fron 1968 to 1976 so that camera was likely a Nikonos I. In a related subject, the Tektite I project began on Feb 15, 1969. Monterey Bay Aquarium guide Ed Clifton was one of the scientists who participated. If anyone is interested, maybe I can prevail upon him to make an appearance at this year’s get together.